What else can you ask for? 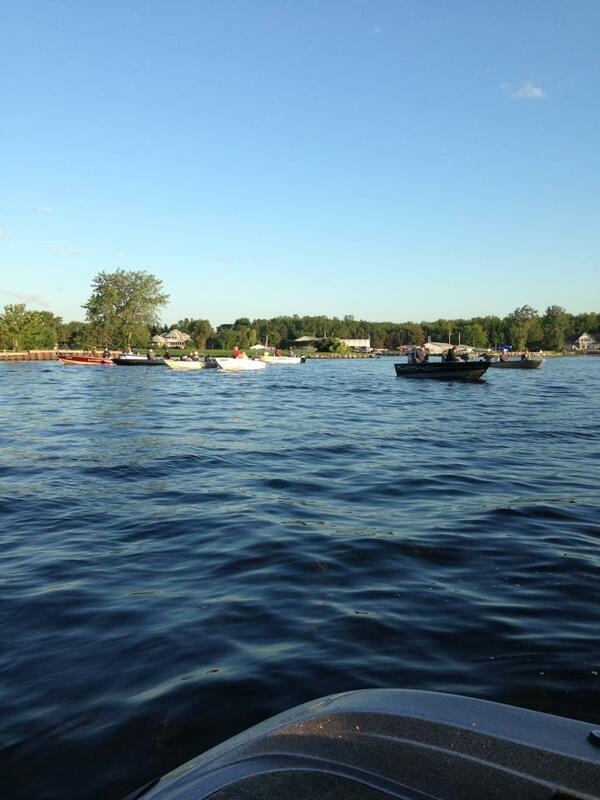 A picture-perfect day and a chance to compete with some of the best walleye fishermen in the area. 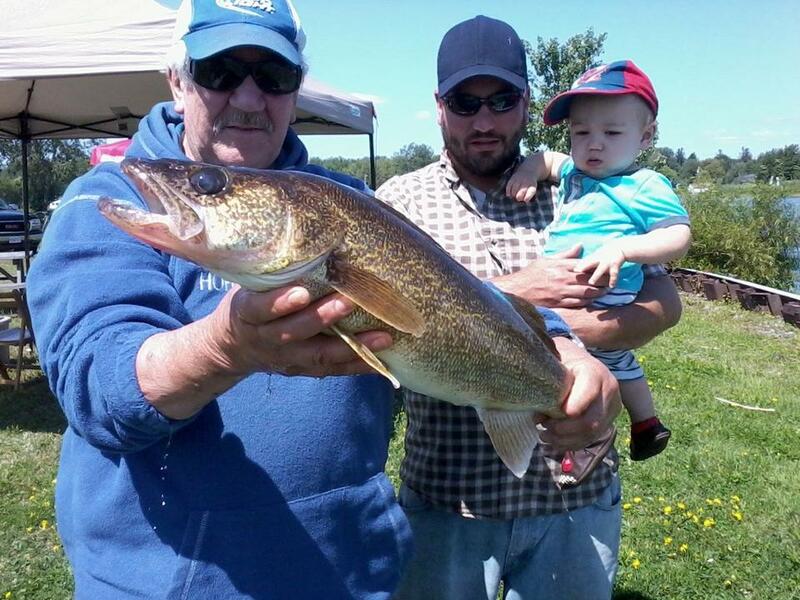 This year’s Walleye Tournament held by the South-Lancaster Fish and Game Club was a total success. 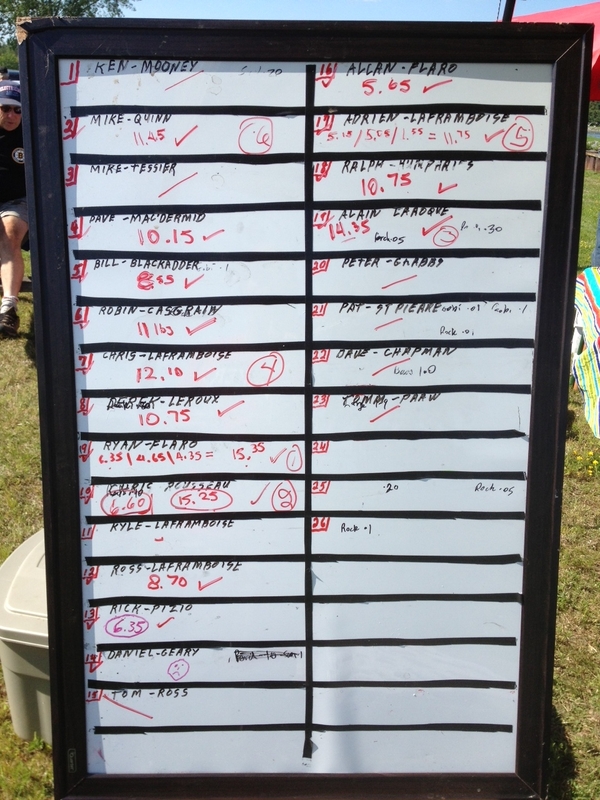 With a slightly higher than expected 23 boats enrolled, the stakes were high and the competition proved to be solid. 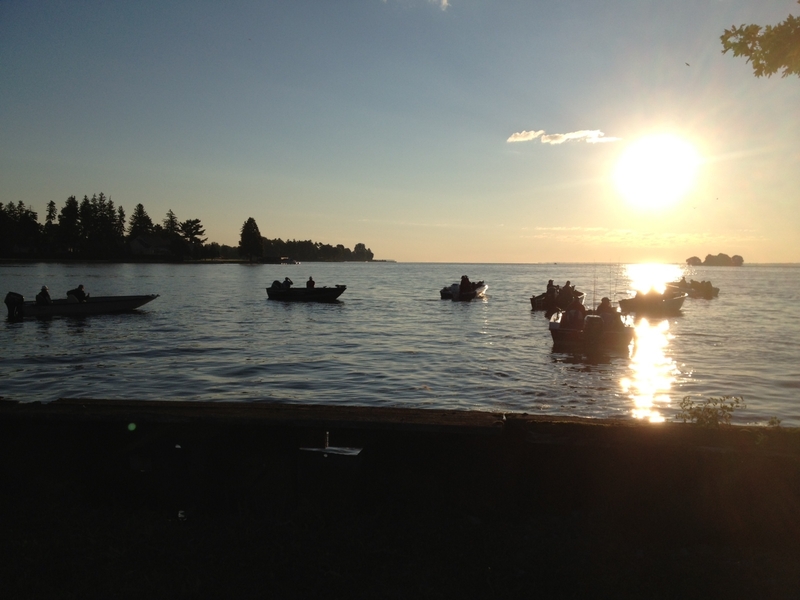 This year’s tournament took place near Mac’s Marina at the old Lancaster-Inn point, which works perfectly as a both a neutral starting point between the islands and the big lake and at offering an absolutely breathtaking view of the Carin and Lake St-Francis. First and foremost. I would like to personally thank Glen Patton, Gene Picard, Shawn St-Pierre and Wayne Woods for volunteering and handling the leg-work that day. The event can’t happen without the help of volunteers and I know these guys would have loved to be fishing too. So a huge thank you goes out to them. The day began with a speech for the ages from tournament co-organizer, local legend and fellow angler, Derek Leroux. As the dead calm waters betrayed the fiery battle that was about to take place, he spoke wisely, stoically sending competitors off with finely chosen words of wisdom. Engines purred as anxious moments finally led to a long anticipated shot-gun start on a beautiful Saturday morning. Well, Derek’s version of a shot-gun anyway. All was set for the makings of a memorable day…which in the end definitely did not disappoint. 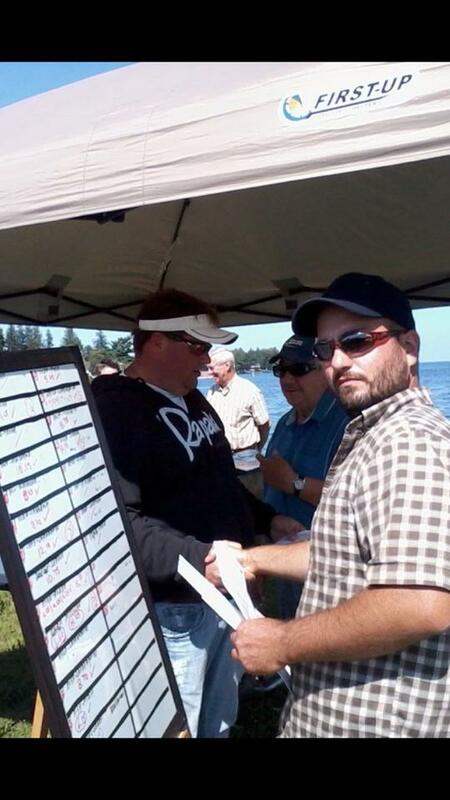 Tournament honours this year went to none other than Ryan Flaro who earned his stripes for the win with 15.35lbs. 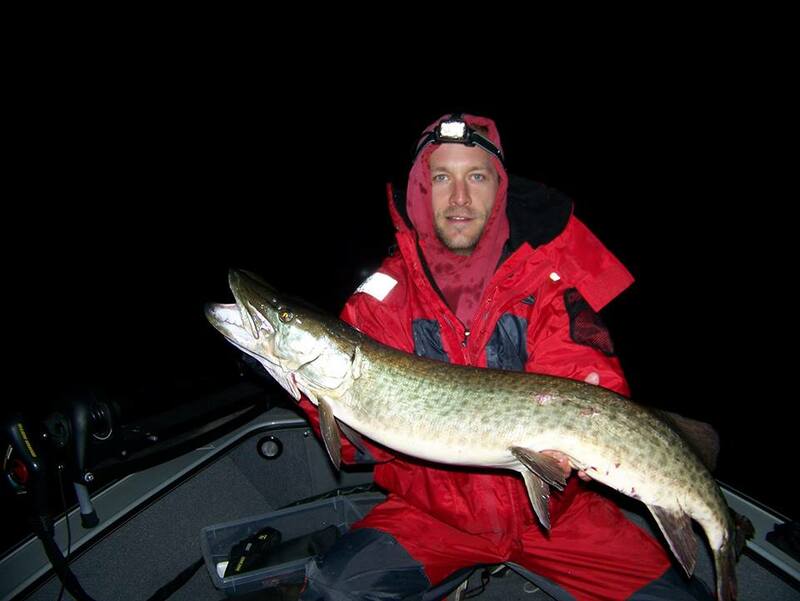 Ryan puts in as many hours on the river as anyone I know and his hard work and relentless pre-fishing paid off. And when I say paid off, I mean with a 1,035$ pay off to be exact. Not bad for a day’s fishing! From speaking with Ryan I know he experiments a lot and absolutely loves to fish. Congratulations on the W Mr. Flaro! Fully deserved. Coming in close second, in what ended up being a fierce battle that culminated into an exciting photo-finish, are the brother duo of Kris and Mike Rousseau who weighed in at 15.25lbs. Did I mention how close a finish that is? I’ve been lucky enough to fish with both of these guys and I can testify that they are incredibly knowledgeable anglers. These two together in a boat have to be considered as favourites to win any tournament. Kris and Mike’s run-and-gun approach earned them not only 2nd place and a nice chunk of change at 575$, but also biggest fish of the tournament prize with a beauty 6.6lbs beast, worth an extra 150 bucks. Great job guys! One couldn’t possibly come up with a better one-two finish. Next, coming in at the 3rd position, is the team of Alain Larocque who weighed in a solid 14.35 lbs. That is an average of 4.78lbs per fish! Their efforts earned them 345$ which definitely covers gas money. The next two money positions were awarded to the famed Laframboise family. Chris’s and Adrien’s boat finished 4th and 5th respectively, earning 230$ and 115$ with total weights of 12.10lbs and 11.75lbs. 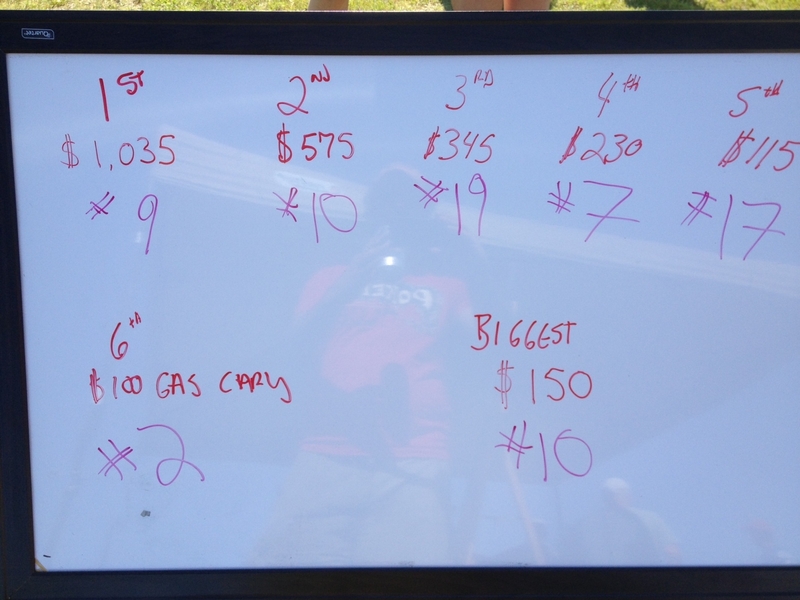 The final position with earnings went to Mike Quinn’s team, who pocketed 100$. Unfortunately there were no real monsters caught this year. And by that I mean fish over 8 pounds. In talking with many of the fisherman after the tournament opinions vary on why that is, but most agree that predominantly cool and rainy conditions this year did not help fishing quality. There were still some beauties caught however, and more importantly, to quote Miss Stevie Smith, a good time was had by all. We hope that this year’s success encourages even more people to take part in the next one. Until next time, Stay Outside! Jigger. 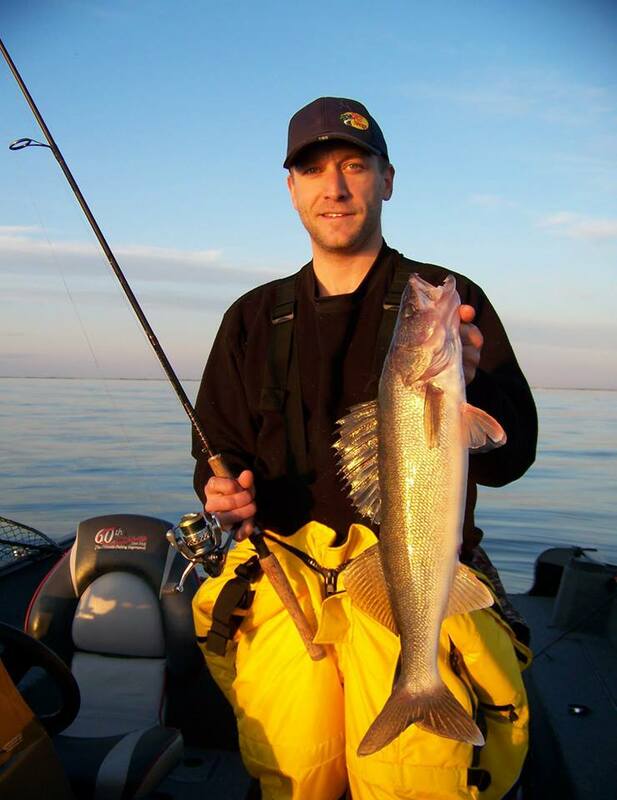 Here is your chance to get in a great day’s fishing, meet some of the best walleye fishermen around the area and maybe make a few bucks in the process! If you’ve been thinking of fishing a tournament and haven’t yet I can testify that they are a ton of fun and a great learning experience. So whether you’re a seasoned vet, or a weekend fishermen like me, I encourage everyone who is thinking about it to join. These events are always a good time. All useful information is below. If you have any questions, just leave them in the comment box! “Everything is a month behind this year” is a phrase I’ve heard a few times around the lake. Indeed, we’ve had a very cool (and wet) spring and despite last week’s heat wave the trend seems to want continue. It seems I’ve spent more time pumping water out of the back yard on weekends than fishing. The rain not only completely soaks things up making it impossible to get to my boat, but it also changes things dramatically on the river. We are now nearing August and I have yet to see the water near shore be completely clear. 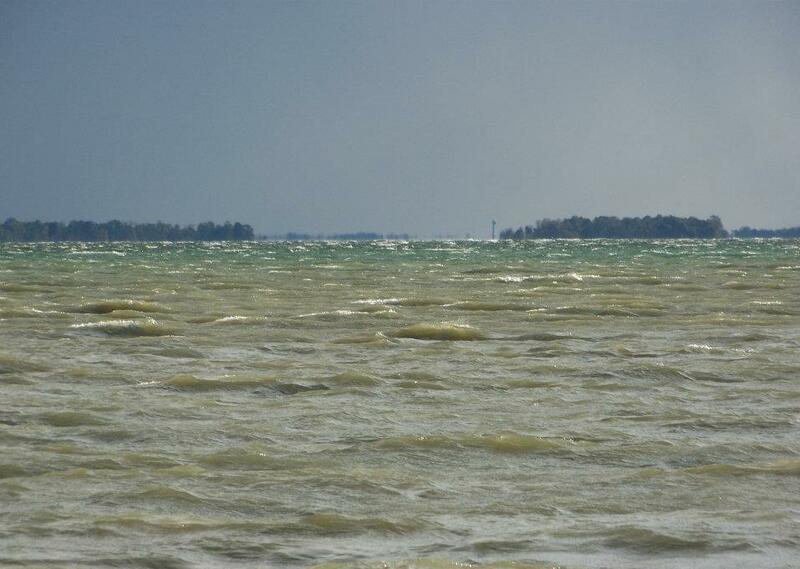 The shoreline normally looks like an aquarium in the summer. This year it’s tinted brown from runoff and has been that way pretty much since ice out. 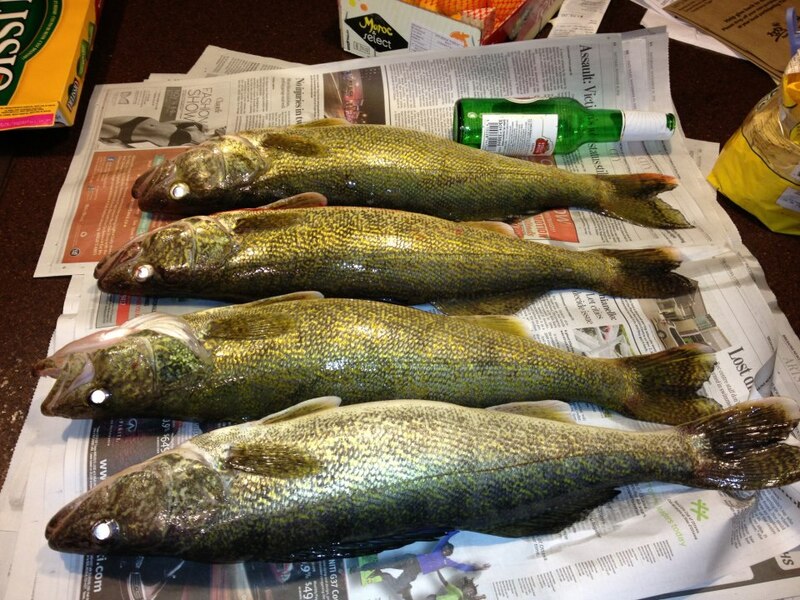 There is no doubt that walleye fishing has been slow. Is it because of the extra rain and cooler waters? I can’t be sure, but personally I think there is a correlation to be made. Typical patterns aren’t working and fish are finicky. However, as the old proverb goes, where there’s a will there’s a way. You can’t choose the weather, so when faced with adverse conditions, even over a very long period it’s important to adapt and change your game so that you can stay on fish with regularity. Besides, a huge part of the fun of fishing is unraveling the puzzle and feeling the utopia of success when you do figure things out. At least it is for me. Allow me to resort to clichés for a minute. The turning point if you will, this season, was a fishless day. You see, fishless days irritate me to the very depths of my being. They are not part of my vocabulary. 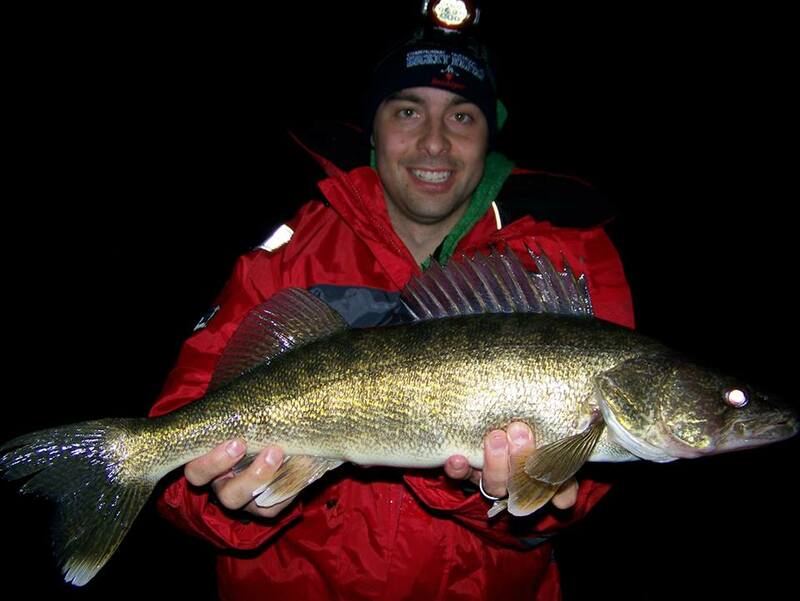 I spent hours that day searching for walleyes on structure that’s usually a walter magnet that time of year. When the fishless minutes turned into hours, instead of adapting, slowing things down, I kept fishing spot to spot, thinking that there HAD to be fish on the next one. Frustration got the better of me and I headed home, defeated, deflated, embarrassed…well you get the point. That night, I light a fire, sat back with a nice scotch and began to study the entire length of the lake on the map, east to west, prepping for redemption. I started eliminating water (and there was a lot to eliminate). I eventually concluded that fish could still be in post-spawn areas. As I was planning out a route, and starting point, I set up a few rods to troll shallow, a few to troll a little deeper and a couple more to jig with. I made sure that whether it be plugs, spinners, jigs, live bait you name it; If it’s been known by man to catch walleyes at some point in history it was going to be part of my arsenal the next morning. I started working one of the main feeder-rivers in our area and planned to make my way towards more typical summer patterns from there. I fished shallow, I fished deep, I jigged, trolled and despite it being another tough day, I had put 12 fish in the boat by the end of it and more importantly, I learned a very valuable lesson. Try everything. By the end of that second day, I had found a few fish right in the feeder river, and then on the first flat adjacent to it, but nothing with size. I fooled 2 or 3 fish on spinners and some on plugs, but the jig bite ended up being the best producer in the colder water. From that day on I have been able to find a few fish here and there all summer using the same basic try everything techniques, and with some perseverance slowly but surely began to figure out the fish. One thing I’ve found to be particularly interesting is the variety of areas where I found fish in this season so far. I have caught and seen fish on my underwater camera from 8 feet deep all the way to 70 feet, including one day where I patterned fish in deep structure and caught them on jigs in 50 to 60 feet. For whatever reason, fish were deep for a while and eating at those depths. I started experimenting and found that a few details made a big difference. First off is jig size and type. I noticed that though bigger jigs got to the bottom in a hurry and allowed for good bottom contact in the current they didn’t get as many bites. I think it has to do with how it looks to a fish. The lighter the jig, the more natural your bait looks, but if you go too light, you have no control over it and that doesn’t work either. With proper boat control, I narrowed it down to a 1/2oz jig tipped with a gulp minnow or anything that looks like a 3-4 inch minnow. The key element in keeping the jig on bottom is staying as vertical as you can and being in control of the drift. In order to keep my boat from drifting too quickly or off of to the side of the structures I was fishing, I used a tandem of a drift sock attacked to the stern on a cable split used for water skiing and my bow-mount trolling motor. Man was I happy with the results. The combination of both gives me total control on both East-West drift speed and North-South variations. It really did make the difference. It’s interesting to note that this boat control technique also really helped me on a trip up to Cabonga Reservoir a few weeks later jigging for lake trout. But let’s save that story for another day for now. One important thing to mention is that if you’re going to target deep fish and you want to release them, I’d recommend bringing them up very slowly and saving that bite for colder water conditions. 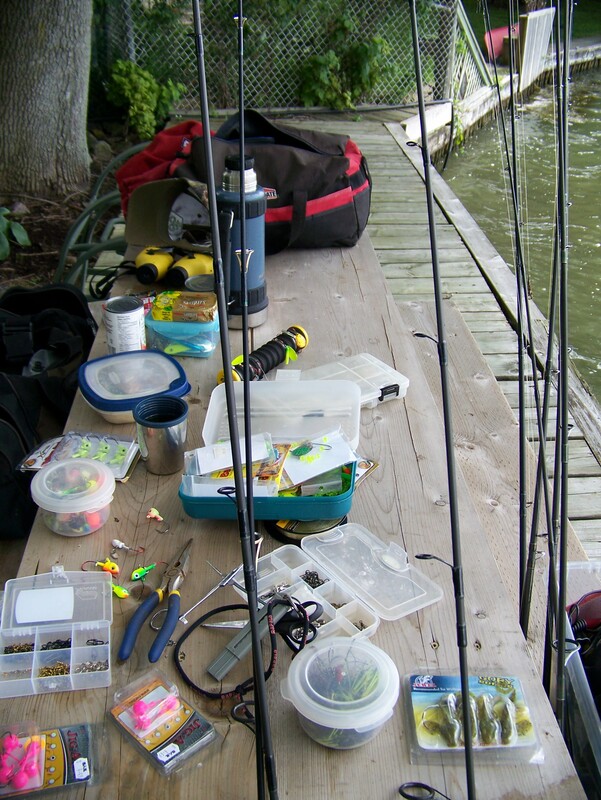 I avoid fishing deep in the hot summer months when the surface temperature reaches 65+. When fish come up from that deep their swim bladder expands with air from the release of pressure. 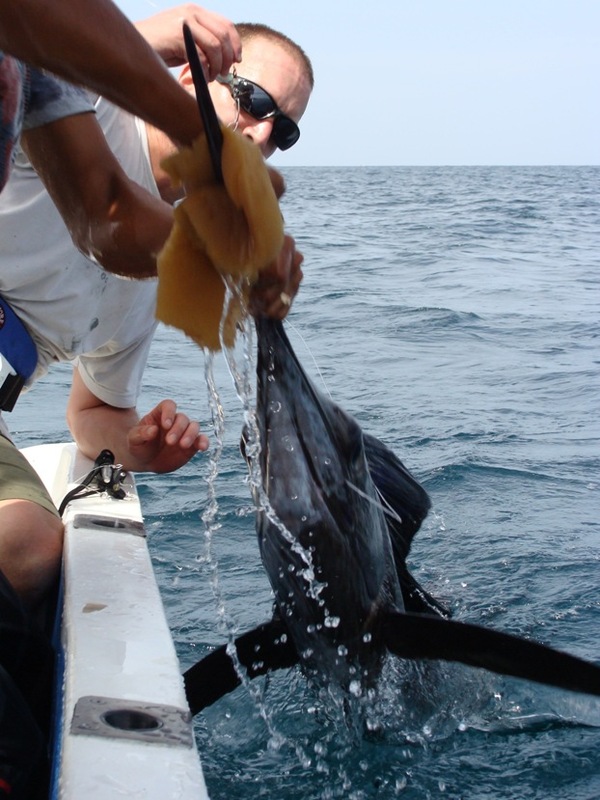 When release them with a bloated swim bladder they go belly up and eventually die. In warmer water the shock to the fish coming up can be too much. If you happen to have been an aquarium owner at some point, you’ll know that fish are very sensitive to temperature changes. . Subtle changes in temperature can be quite dramatic to them. Besides, once the surface temperature reaches 68 or more, it’s possible to find aggressive fish everywhere in much shallower areas. I release most of my fish, and almost all of them in the warm water because I personally find they start tasting a little weedy. But in the spring and fall, I like to keep a few for my famous jigger fish-roll feast. If you live near Lancaster, or have visited the area, it’s likely you’ve met someone who claims to make the best fish-roll around. In fact, everyone around here thinks that, and I’m no different :). At the end of the day, I’ve uncovered a new way to catch walleyes that works very well and I’ve learned a thing or two about fishing and about adapting. Even though I’ve moved back to the shallows now, the deep water jigging was certainly a nice change from usual tactics, a fun learning experience that yielded a few nice surprises too as you can see. Oh and for you bass fishermen out there, there are a few monster Smallies hanging out down there too… Until next time, Stay Outside! When one of my best friends told me last summer he was getting married in Costa Rica I asked jokingly if he had any room for a small-framed fisherman in his luggage somewhere. Turns out he extended an invitation and I thought, Costa Rica eh? Why not! After all I’d heard a lot of great things about the place and people who visit call it El Paradiso. 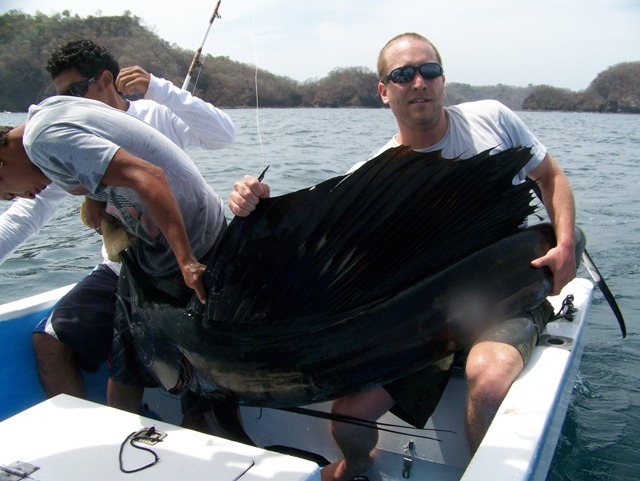 A few google searches about the area we were staying in, Playas del Coco, Guanacaste in the Northwestern part of the country revealed a renowned sportfishing area famous for it’s Sailfish, Dorado, Roosterfish, Tuna and many more. It was enough to convince me. After a few days of acclimatizing to the searing heat of 36C and a relentless equatorial sun I started asking around about fishing. I met a local named Elmund at a place called Coco Palms who specializes in adventure tours in the area. He took us out to Rio Tempisque in a national park of Costa Rica called Pallo Verde. This is a freshwater river straight out of a crocodile dundee movie. The river was absolutely overflowing with crocodiles, iguanas, jesus lizards and countless bird species. On the shores of this muddy hub of life howler and cappucino monkeys rested in trees and stared at us curiously as we floated by. Some of the monkeys however weren’t content with only watching and they got close, real close. On the way back from the trip I asked Elmund if he liked fishing. He said he did some fishing but that it wasn’t his specialty. He did however tell me he could set me up for something the next morning. He told me he knew two guides who have been doing very well in the area lately. I was to meet them “next to the big tree at the beach in front of town” at 8am the next morning. The date was set. I was about to head out fishing on the open tropical Pacific. When I made my way to the big tree the next morning (gotta love addresses in Costa Rica) I was reeling with excitement. 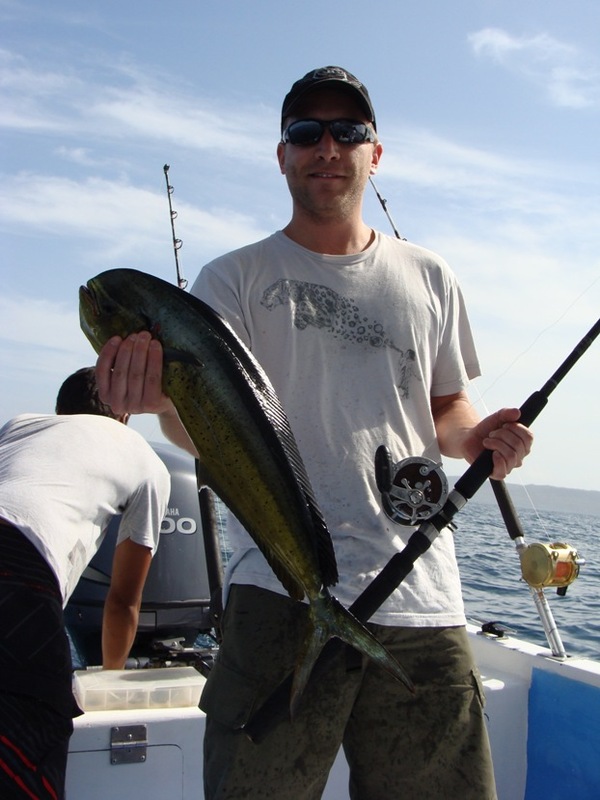 I had never been on the Pacific Ocean before let alone for a fishing trip. The two guides who only spoke very limited English showed up right on time with a cooler full of melons, pineapple and of course, beer. After a few handshakes and awkward moments of attempting conversation in my very limited Spanish we were off and soon beyond the northern tip of Playa del Coco into open water looking for pelagic giants. The ocean was calm that day, at least when we got started. As I savoured the moment and snapped pictures the 20foot boat came to a stop near a rocky island off a point. One of the guys started throwing a quarter ounce jig at the swell around the island and soon handed me the medium action baitcaster. I reeled in a silver fish that fought like a 3lbs smallmouth but probably weighed in at around a tenth of that. 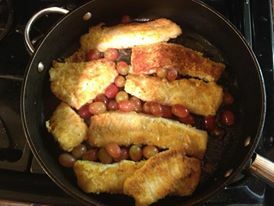 Fish in saltwater are like freshwater fish on meth. They are absolutely insane and never, ever stop fighting. When I pulled in this fish and the guy said “bait” I thought to myself I’m not really sure I want to see what eats these. When the livewell was nice a full of these little guys we headed off once again further north. The guys had 3 rods setup for trolling. One on a makeshift downrigger right behind the boat and two more stretched out to the sides trolled high in the water column. We were fishing open water in about 100feet of water for the most part. I am really not sure how deep he was running the deep rod because of my lack of ability to ask that in Spanish but it looked to me like he was setting it up around 30-40 feet deep. All three were rigged the same way, 50lbs test mono tied to a wire leader and one large treble hook. Before I could get comfortable one of the guides signaled for me to grab one of the rods and I was fighting my first ever saltwater fish. He took me for a good ride. It took one run towards the bottom and then turned back the other way and headed for the boat. 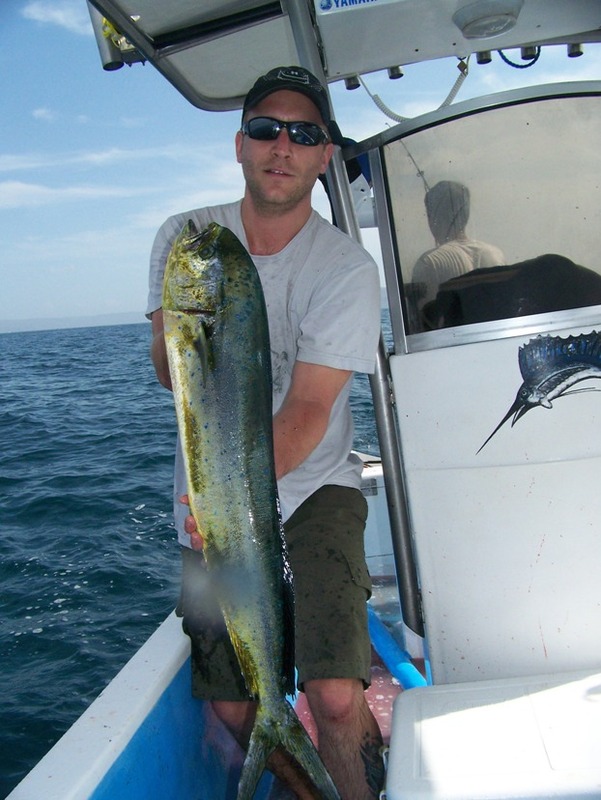 Not long after that it’s beautiful green back and silver sides flashed in the crystal clear water and I had my first ocean fish, a very respectable Mahi-Mahi and my first saltwater fish. As I was taking in the moment and enjoying the beautiful tropical Pacific scenery, our two guides quickly set the rods back up and we were trolling again almost immediately. It didn’t take long until the reel started screaming again. This time, the fish moved faster and darted left and right like a silver missile. A few minutes later, I was holding a Tuna Mackerel. A few minutes later, another fish hit. This fish however had a little more weight to it. It was my friend’s turn to grab the rod. This fish fought hard. It’s really not comparable to anything I’ve caught in freshwater. 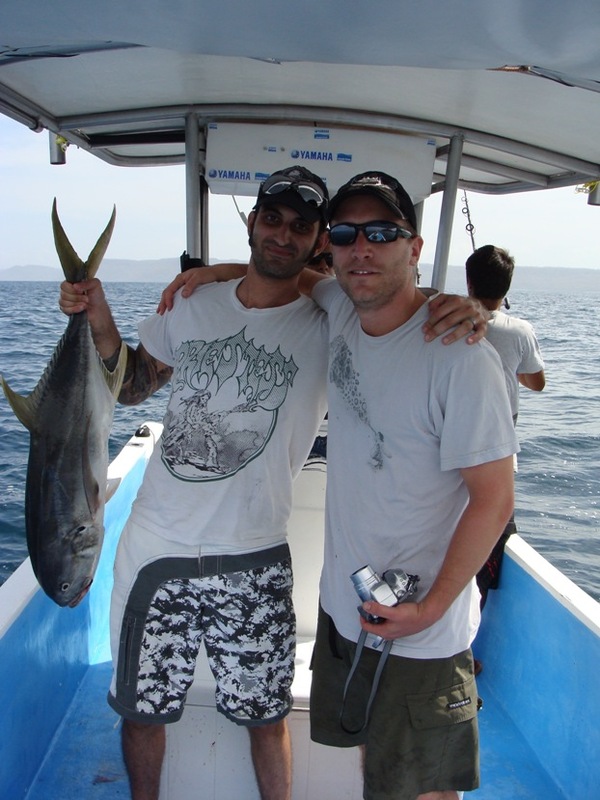 After a good struggle and two or three reel screeching dives, JP was proudly holding a beautiful yellow-fin tuna, who eventually became our BBQ dinner on the beach that evening. The action slowed a little after that fish. Our guides decided to switch location and move North up the Pacific coast a few miles. 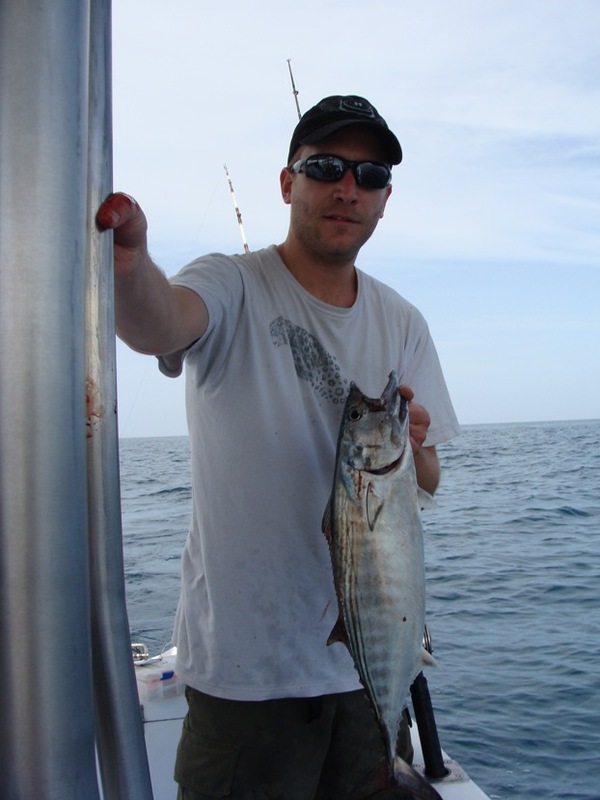 Fishing in the ocean is vastly different than fishing a river or lake back home. When fishing the st-Lawrence for example, I’m always on the lookout for structure, cover, current and focus is on bottom content. On the open ocean, guides are looking for surface activity, birds and baitfish shools. As we were making our way towards this new area, one of the guides told me he spotted a sailfish. He pointed in the direction where he had seen it as the boat simultaneous made a 180 degree turn and headed in that direction. To this day I can testify that I didn’t see the fish or anything different on the water for that matter. Let’s just say these guys had very well trained eyes. After a few minutes going over that area with the bait, it seemed our sailfish had eluded us. Just as they were about to give up, the reel started to tick and then….pandemonium. Everything happened very quickly, but before I knew it, I was handed the rod and almost at the same time I watched a sailfish tail-dancing on the surface about 200 feet behind the boat. I couldn’t believe what was happening, that this monster fish was actually hooked and I was holding the rod. It was surreal. I tried my best to gather my senses and stop shaking. As instinct kicked in, I checked my drag was perfect and did absolutely everything in my power to make sure I didn’t lose this fish. The fight lasted a good 30 minutes. I could feel the lactic acid building in my forearms but I wasn’t about to give up. The fish took drag, jumped completely out of the water at least 5 times and gave me the thrill of a lifetime. If you’re looking for something different and you have a case of cabin fever this winter, I would strongly suggest considering a trip to Costa Rica. It’s relatively inexpensive, the folks there are as friendly as they come, and if you’re a nature nut you simply put will not run out of things to keep you busy.